Nia Coffey races past a defender. The former NU player was selected fifth overall in the WNBA Draft on Thursday. For the first time in her life, Nia Coffey will live somewhere where it doesn’t snow. The former Northwestern superstar was selected by the San Antonio Stars as the No. 5 overall pick in the WNBA Draft on Thursday, making her the highest Wildcat player ever selected. With her pick, she becomes just the second NU selection in the WNBA Draft. Amy Jaeschke was a third round selection in 2011. Coffey’s high selection was mostly expected. She earned Associated Press honorable mention All-America honors each of the last two years, and was pegged as a first round pick in most mock drafts. She averaged 20 points and 10.4 rebounds this season, her fourth consecutive as a member of the All-Big Ten first team. 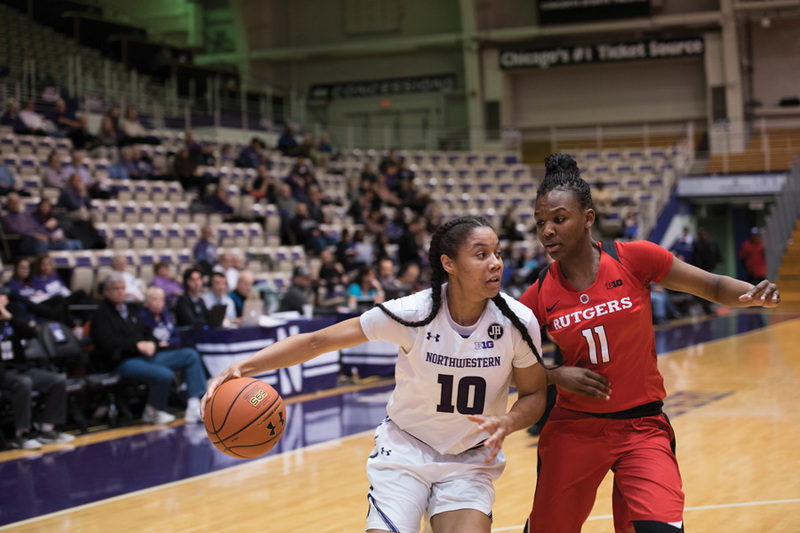 She closed her NU career as the program’s all-time leading rebounder and second-leading scorer. Still, she was selected a few picks higher than expected. Many projections slotted her around No. 9 overall, and she was taken before several highly regarded post players, including Maryland’s Brionna Jones and Washington’s Chantel Osahor. A versatile 6-foot-1 forward, Coffey played primarily at the ‘4’ spot for the Cats. She is considered likely to move to the ‘3’ at the professional level, however, to take advantage of her ability to shoot, handle the ball and lead the fastbreak, a core tenet of the WNBA game. Though Johnson admitted that Coffey will likely make the transition at some point, she said the Minnesota native will have an opportunity to play right away and begin her career at her more comfortable ‘4’ spot. Coffey joins a Stars team firmly in rebuild mode. They finished last in the league last year, and rookie guard Moriah Jefferson was their second leading scorer at 13.9 points per game. The Stars took Washington guard Kelsey Plum, the all-time leading scorer in NCAA history, with the No. 1 overall pick Thursday as they continue to build a young core. In light of their recent struggles, they are unlikely to contend for a championship in the near future. Nonetheless, Coffey said she was overjoyed to hear her name announced and excited to begin her professional career.